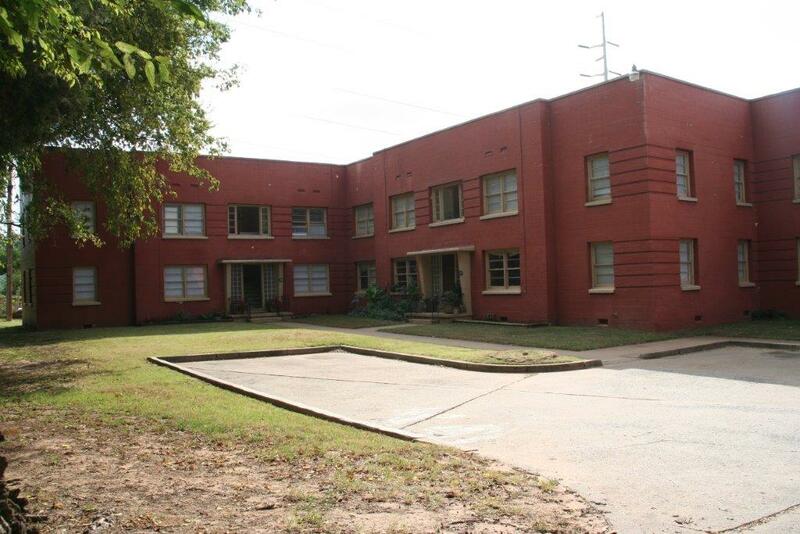 The Sally Ann Apartments, constructed in 1948, are a representative example of a post-World War II Modern style apartment building. Located at the western edge of the Riverview Historic District and south of downtown Tulsa, the complex is distinguished by its site configuration and building mass. The two apartment buildings are each comprised of three building blocks and are a mirror image separated by a driveway leading to the rear of the property. The building layout is stepped, framing a shallow courtyard on the north side of the complex. The building reflects a transitional period in Tulsa. As a good representative of the post-WWII Modern Movement in architecture, the Sally Ann Apartments are distinguished from their early twentieth-century predecessors by their concrete exterior, horizontal massing, and subtle articulation of form and materials. Specific distinguishing characteristics include the stepped form of the rectangular building blocks, the projecting center bays with cantilevered concrete canopies, and the windows and contrasting corbelled brick that form a horizontal band around the front facades in contrast to the smooth concrete block facades. Without any ornamentation, these subtle details are the only articulation of the building facades. Garages were a feature of private homes often missing in the early twentieth-century apartment buildings. The Sally Ann Apartments were designed and constructed with a detached garage that provided covered auto storage for apartment tenants. Sally Ann Apartments was listed in the National Register of Historic Places on September 8, 2015 under National Register Criteria A and C. Its NRIS number is 15000581.